As you take this step into the working world or furthering your education, we hope you’ll continue to be part of Amnesty’s global movement to protect and defend human rights. 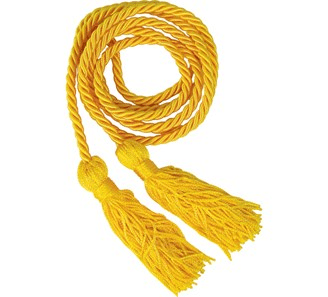 To show your Amnesty spirit, we’re offering graduation cords in exchange for a little information about your Amnesty experience and where you’re headed next! Complete the survey below, including the option to sign up to receive SMS text alerts and Amnesty International USA emails. Let us know if you’re heading to another school or a new city, and how you want to be involved with human rights work! Provide an up-to-date mailing address and your date of graduation. We need at least one week’s notice to get your cord out on time. Watch for follow up from us soon! Please complete this section exactly as it should appear on the mailing label for an address that you are certain you can receive packages at. If the school name is a required part of the address, please make sure you list that! Please list the full school name without abbreviations. Are there any other roles you've held during your time with Amnesty? Which human rights issues did you work on and feel most committed to? Are there other human rights issues you worked on and feel committed to? If heading to college, do you know where you're going? If heading to a new city (different from the one above), where will you be going? Wherever you’re headed, we would love to connect you with future opportunities for human rights work. Which of these are you interested in learning more about? Would you like to be contacted based on your responses to the previous questions? For example, to connect you with a group leader at your new school. How can Amnesty support you in continuing your involvement with human rights work?